Robbie Stevens gives direction to Jack Bailey, left, and Ron McCoy. Last week, we started putting the finishing touches on our Jack Bailey Buyer Consultant Training Program. 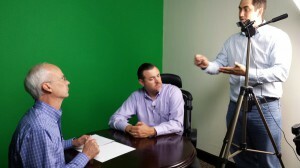 The program will last 10 weeks and consists of a weekly coaching call with Jack Bailey, our resident buyer expert and broker/owner of Help-U-Sell Greensboro; worksheets; homework assignments; and videos, which we filmed at the home office in Sarasota last week. Jack has consistently closed more buyer sides than seller sides for many years running, and he created this program to teach his fellow Help-U-Sell franchisees how to achieve their own buyer-side successes. The program is for brokers and agents who want to work with buyers as a consultant, not as a salesperson, and want to increase their revenue by working buyer sides. It will teach brokers and agents how to educate buyers on everything from what makes up a mortgage payment to how to reduce debt. Agents and brokers will also learn how to build trust and confidence in buyers. In addition to introductory videos for each of the 10 sessions, we also filmed a promotional video for the program and a sample short buyer consultation. 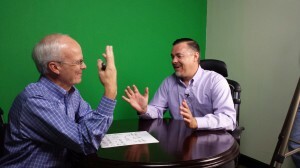 Jack Bailey, left, and Ron McCoy share a laugh between takes during the filming of Jack's Buyer Consultant Training videos. It was long hours under hot lights, but our stars, Jack Bailey and Ron McCoy, managed to have some fun, too. Attendees of the Success Summit might get to see some of the bloopers. In the meantime, here is a lighthearted moment between takes. Watch for information on how to register for the program later this year.